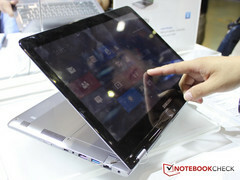 Samsung took the chance at Computex this year to display its prototype Series 5 Convertible and PC hybrid Series 7 notebooks. Samsung has been on the receiving end of many patent allegations to the point where even our colleagues from other publications at Computex 2012 were joking about how the manufacturer's latest gadgets on display could ignite lawyers from Asus and Lenovo. Samsung's booth at the show floor was littered with their recently announced Series 5 convertible notebooks which, hopefully by coincidence, resembles that of the Asus Transformer series or the Yoga from Lenovo. Nonetheless, the "Flip-and-Fold" Series 5 will be Samsung's own take on a touchscreen notebook with a display hinge allowing the lid to be opened up to 360 degrees. From the looks of it, the Series 5 Convertible on display appears to be based off of the chassis of the Series 5 ultrabooks but with a folding mechanism not unlike that of the Lenovo Yoga back at CES. The prototype model uses a magnet to fix the lid shut, but we found it to be rather weak. Reflections off of the glossy display were also hellish on the show floor, even at moderate display brightness. We weren't too convinced with the concept model at the end of the day, so hopefully some improvements will be made before the Series 5 Convertible makes it to the market. Alongside the Series 5 Convertible, the Series 5 Hybrid and Series 7 Hybrid were on display as well. Codenamed "William" and "Jones", respectively, the Series 5 and Series 7 Hybrids are still very much being kept under wraps in terms of internal components. From what we can tell, all models on display were carrying glossy displays with no color shifts even from extreme angles. Consequently, it's safe to assume that Samsung will be utilizing IPS displays or even its own proprietary PLS display as seen on the recently released Samsung Series 9 900X3B.